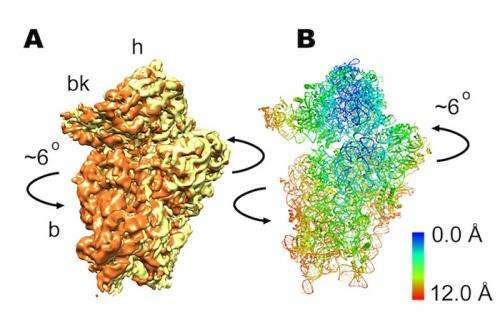 The newly discovered rolling movement shown in (A) three-dimensional cryo-electron microscopy image of ribosome, and (B) computer-generated atomic-resolution model of the human ribosome consistent with microscopy. A). Arrows indicate the direction of movement during transition between the two different states. B). Ribbons represent backbone of RNA and protein molecules within the ribosome. Color bar indicates the amount of motion during rolling. (Phys.org) —A groundbreaking study of the human ribosome is revealing that the tiny molecular machine is more versatile than previously understood. Minor changes in its sequencing can change its operation, allowing it to adapt to a changing environment, as described in a paper published today in Cell. "From a practical standpoint, these first studies of the atomistic mechanism of the human ribosome open a window into a range of diseases, from anemia, to cancer, to Alzheimer's," said researcher Karissa Sanbonmatsu of Los Alamos National Laboratory. The new publication shows the first study of decoding the genetic code by human ribosomes in atomic detail. "Cracking the mechanism of human ribosomes will have applications to a variety of diseases, so we are now seeing the real payoff of over a decade of computer simulations of the ribosome," Sanbonmatsu said. For more than a decade, Los Alamos has been successfully involved in applying computational approaches for modeling the structure and dynamic aspects of large and biologically important molecular machines such as the ribosome. "The insufficient precision of the developed models often hinders the direct connection of their structural roles to various functions they perform. This problem is solved when connecting the structural modeling to high-resolution cryo-electron microscopy," said Chang-Shung Tung, another Los Alamos researcher on the project. In general, molecular machines permeate all life forms, including humans. It is within the ribosome, found in all living cells, that proteins are created, making the ribosome one of life's most fundamental machines. This research shows that the ribosome is highly programmable, where minor changes in its sequence change its operation. These changes allow it to adapt to the changing environment. Specifically, the human ribosome shows subtle differences in overall structure from the bacterial ribosome; yet these changes alter its inner workings, going from a molecular mechanism based on a 'rocking' motion to a 'rolling' motion. This is an insight that was unknown until this study was performed. "The ribosome has a masterful design: a few bit flips of its sequence transform its repertoire of motions, enabling it decode genetic information with even higher fidelity, while adapting to the dramatically different environments presented by human cells," said Sanbonmatsu. Ribosomes are the target of 50 percent of antibiotics. To eliminate side effects and improve efficacy, researchers must understand how antibiotics interact with human ribosomes in addition to bacterial ribosomes. In addition, malformed human ribosomes are related to many different human diseases. In the paper, the team presents subnanometer resolution cryo-electron microscopy maps of the mammalian 80S ribosome, revealing significant differences in the elongation mechanism between bacteria and mammals. The cryo-electron microscopy was performed by the Christian Spahn Lab @ Charite Medical College, Berlin, Germany The computer modeling was done at Los Alamos National Laboratory and the New Mexico Consortium, supported by the Laboratory's Institutional Computing resources.